It’s not the opening to a joke; it’s what you’ll find at this year’s KIDfest. 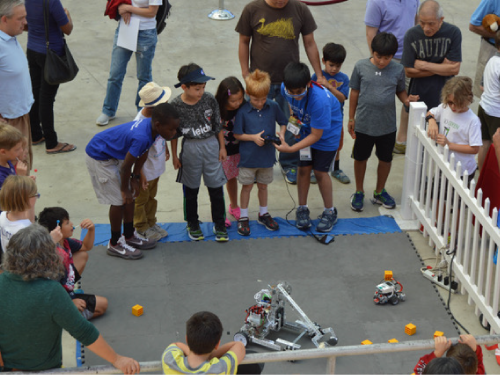 Three local robotics teams who participate in FIRST Robotics, a national robotics competition for grades 7-12, will be on hand to showcase their award-winning creations—which are programmed to play games by remote control and, incidentally, weigh as much as 150 pounds! You’ll meet Wizards.exe, FTC Team #9794, based in Rockville, whose students attend Richard Montgomery, Wootten, and Montgomery Blair High Schools, and Julius West, Robert Frost, and Takoma Park Middle Schools. Wizards.exe is capping off an exciting year that took them to the FIRST World Championship in Detroit, where they won the INSPIRE award for excellence in robotic design, engineering and community outreach, and then to the FIRST Global Competition in Mexico City this summer. Parvathy Shivaramakrishnan, mother of team member Maanav, notes that the Wizards.exe are “big fans” of KID Museum, where they offer robotics workshops and mentor younger kids in FIRST Lego League. Come out to KIDfest on Sunday, September 23 in downtown Silver Spring, and meet these inspiring students. The future of robotics starts here! Learn more about KIDfest at kidfest.org.